NEEDHAM, Mass. – In last year’s win at Macktaz Field, it was the King Philip defense that tossed a shutout in a convincing win over Needham. On Friday night, in the first round of the Div. 2 South sectional at Memorial Field, the Rockets got revenge with a shutout of their own, beating King Philip 24-0 to return to the semifinals. “Last year we had the better team and made more plays and this year they had the better team,” said KP coach Brian Lee when asked about Needham wanting revenge for last year’s win. Needham took the lead on its first possession of the game. Senior Sam Foley hit John Andre for 17 yards to the 44-yard line and then two plays later found Andre again for a 56-yard touchdown on the far sideline. KP had missed an open receiver on third down on its first possession and then fumbled to start its second, which was recovered by the Rockets at the Warriors 25. The defense made a huge stand forcing a turnover on downs to stay in the game. The Warriors started to move the ball on the next possession when John DeLuca hit James McGhee for 13 yards and a first down and Steven Eaton took a pair of carries 11 yards for another into Needham territory at the 49. But, the drive stalled under heavy pressure from the Needham front four; Kevin Bruce and Rudy Hasenfus sacking DeLuca on back-to-back plays. 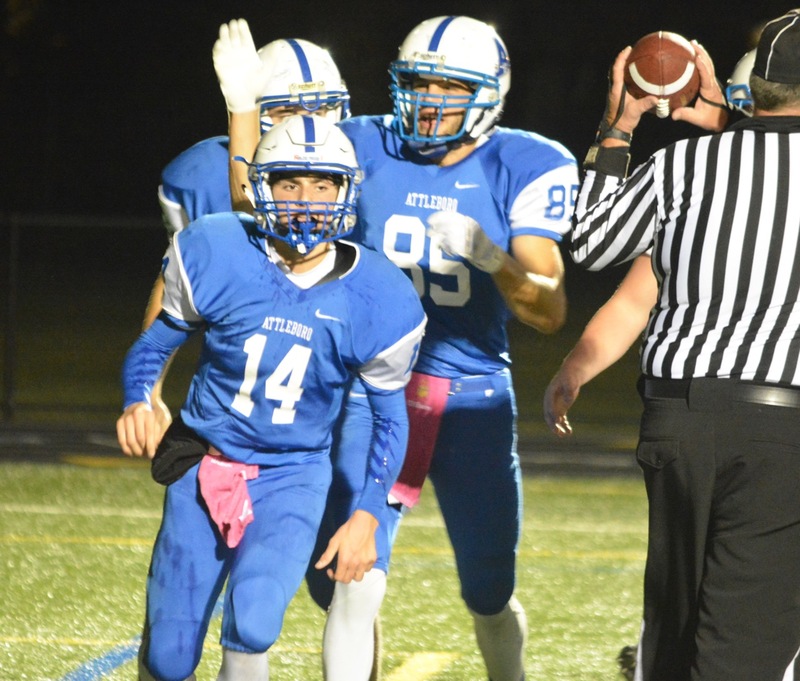 The secondary continued to struggle against the Needham passing game. Foley found Joe Bruno for 20 yards down to the Warriors 24 and then on fourth and eight he looked towards the end zone and senior Luke Geraghty. It looked like he had overthrown the receiver only for Geraghty to leap and pull it in with one hand. King Philip had the ball in Needham territory twice more before halftime but both times the drives stalled and the Warriors came up empty. On the first a good punt return by Leo Munafo put KP on the Needham 42. DeLuca had a pair of keepers for 15 yards and Giovanni Fernandez had a couple rushes for nine yards to get the ball down to the Rockets 18. Two incomplete passes and a scramble from DeLuca that came up two yards short ended the drive. The second was also ended by good pressure from the Rockets with Bruno and D.C. Cox combining for a sack of DeLuca on third down to force a punt. The momentum could have turned early in the second half. Ryan McCarthy recovered an onside kick attempt by KP, but Needham started the drive in a hole after two penalties brought the Rockets back to first and 25. Foley got nine back on a keeper and then completed four straight passes down to the KP 21. His next pass went in and out of the hands of KP linebacker Corey Lombardo, who was all over the field for the Warriors, allowing the drive to continue and Alex Sliney kicked a 32-yard field goal to make it 17-0. Needham gave KP another chance when a snap flew over the head of Foley and was recovered by Michael Riggs at the Warriors 46. But, on the very next play, DeLuca fumbled at the end of a five-yard keeper and Needham go the ball right back. The Rockets took advantage and effectively sealed the victory when Jared Sklar broke a tackle at the line of scrimmage and raced 43 yards for a touchdown. The extra point made it 24-0 with 10:15 left to play. King Philip (3-5) will play the loser of Wellesley and Braintree next week. ATTLEBORO, Mass. 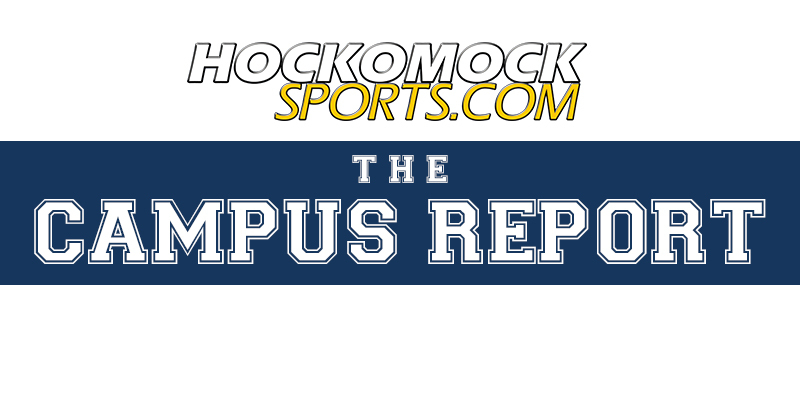 – It was only Friday morning when Attleboro knew that it was going to have to make a change at quarterback. An injury sidelined starter Tyler McGovern, who was on crutches on the sidelines that night, forcing sophomore Cameron Furtado to take over under center for the Bombardiers. Rather than be overwhelmed by the moment, Furtado provided a spark for an offense that had been struggling to score points and was shutout last week by rival North Attleboro. The Bombardiers scored on each of their first two possessions and jumped out to a three-score lead by halftime to get back to .500 on the season with a 25-15 win over King Philip in a game that had to be moved to Tozier-Cassidy Field because of maintenance on the new track at KP. Furtado made an instant impact for the Bombardiers. After just missing the fingertips of senior wideout Alex Silva throwing deep on the first play of the game, he scampered 41 yards on a keeper to the KP 40. The next play he swung the ball to the outside and Brendan Nunes did the rest for a 40-yard touchdown. After a KP put, Attleboro put together a 10-play, 74-yard drive to extend the lead. Furtado (13 carries, 110 yards) was the key with five carries for 32 yards and he also picked out Alex Silva down the sideline for 36 yards. Furtado, known as a runner, completed 5-9 passes for 127 yards on the night. McGovern is a drop back passer and it was clear at the start that the KP defense had a hard time adjusting to the very different look that Furtado brought to the Attleboro offense. The Warriors, as they have all season, struggled to finish drives. Junior quarterback John DeLuca hit Leo Munafo for 32 yards and moved KP into the red zone, but the Attleboro defense held strong and forced a turnover on downs. KP had a chance after a very short Attleboro punt, but Sean Donnelly recovered a fumble by DeLuca to end the drive at the Bombardiers 23. On the next KP possession, DeLuca was intercepted by Ethan Dubeau at the Warriors 34. The Bombardiers took advantage of the turnover to add to the lead before halftime. After an incomplete pass and a seven-yard carry by John Burns, Furtado hooked up with Silva on a deep slant for a 27-yard score. The conversion was no good for the second time and Attleboro went into the locker room leading 19-0. KP came out of the break and put together a time-consuming march down the field. Starting from its own 33, KP used 17 plays and 9:53 off the clock but again it stalled inside the Attleboro 10. DeLuca (17-29, 158 yards) was unable to hit R.J. McCarthy on fourth and goal from the five to give the ball back to the Bombardiers. The defense forced a three and out and got the ball back at the Attleboro 32. Finally, KP was able to capitalize. DeLuca hit Munafo for 11 yards and had a 15-yard scramble before junior Giovanni Fernandez capped the drive with a three-yard dive that made it 19-7. Attleboro responded on its next drive. The Bombardiers went 61 yards in eight plays to restore the three-score lead. Furtado again found Silva on the big play of the drive, a 27-yard pass to the near sideline that got the ball down to the 23. Nunes punched it in from five yards out for his first rushing TD of the game. KP was not finished. The Warriors went on another long drive, this time using 11 plays but less than two minutes. DeLuca was 7-8 on the drive and also had three carries for 22 yards. He hit McCarthy for a 10-yard TD and scrambled to find Munafo for the two-point conversion to make it 25-15 with 51 seconds left. The Warriors recovered the onside kick, which DeLuca seemed frustrated by when he first hit it but somehow the ball slowly edged past the 10 yards necessary for KP to jump on it. Kyle Murphy and Owen McKenna effectively ended the game with a 12-yard sack of DeLuca, who ended the game with a pair of bombs that dropped incomplete. 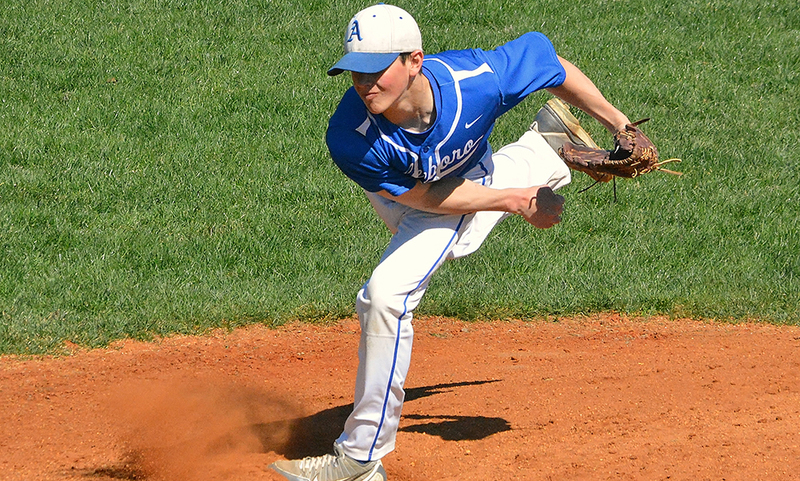 Attleboro (3-3, 2-2) will try to continue building its resume for the postseason next week when it hosts Franklin. KP (2-4, 2-2) still has a good chance of making the playoffs and can bolster that with a win against Taunton in the final game of the regular season. WRENTHAM, Mass. 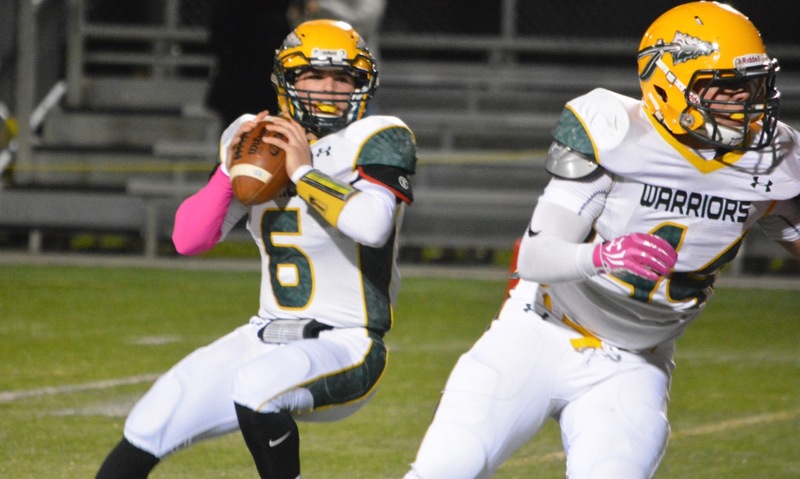 – King Philip took over at its own 28 yard line with 4:59 remaining in a tied game. The Warriors, still searching for their first win of the season, had only six first downs in the game and just two since halftime. Despite having little to no success offensively for nearly 40 minutes, KP marched 72 yards on 13 plays and with just two seconds left on the clock junior fullback Alex Olsen punched it in from a yard out on fourth and goal. John DeLuca added a two-point conversion and the Warriors emerged with a 15-7 victory over Mansfield on the new (and soaked) turf at Macktaz Field. The drive started, as would be expected from the Warriors, on the ground. Two carries from junior Giovanni Fernandez (15 carries, 73 yards) pushed KP to the 41. Then KP caught Mansfield with a perfectly executed screen to Sean Garrity for 17 yards into Hornets territory. The drive nearly ended three plays later when Fernandez had the ball pop out on a third down run, but KP managed to recover. On fourth down, DeLuca (6-15, 76 yards) hit R.J. McCarthy on a slant to just get past the marker for a first down. On the next play, DeLuca looked downfield for Leo Munafo, who somehow pulled the ball down from behind his head for a 24-yard completion. Two DeLuca keepers later and KP was at the two yard line. Olsen got one yard closer on third down and the teams let the clock run all the way down to just eight seconds before the Warriors called timeout and decided on one last play. Olsen got across the line for the touchdown that sent the KP sidelines into hysterics. A Mansfield penalty after the play pushed the Warriors closer, so they went for two and DeLuca added the conversion on a keeper. The two teams combined for seven first downs and eight punts in an opening half dominated by the defenses. Connor Finerty and Nick Martin were everywhere for the Hornets to plug the gaps and stop the Warriors running game, while Joe Bukuras broke up several attempts to get the ball out to Munafo. The young KP defense, with four sophomores seeing regular playing time, counted on seniors Cory Lombardo and Michael Riggs to stop Mansfield’s backs from getting to the edge. KP held Brian Lynch to 33 yards on nine carries and Nick Graham to 25 yards on seven carries. It would be those two players that would combine to get the Hornets on the board in the second quarter, but it took a trick play to open up the Warriors. Lynch took a pitch to the right and stopped to look downfield where he found his classmate Graham streaking up the sideline for a 40-yard touchdown. The score stayed the same as the half entered its final minute, but with 43 seconds left Riggs sacked Mansfield quarterback Anthony DeGirolamo and forced a fumble that was recovered by Fernandez at the Hornets 15. KP took advantage of the short field. After a short run, DeLuca hit Munafo for 13 yards down to the Mansfield one and on the next play Fernandez burst through the middle to tie the game at 7-7. The game went back and forth with winning field position in the windy, rainy conditions seeming to be the primary goal of both offenses. Mansfield gained the upper hand in the fourth quarter with KP pinned back several times, but could not turn territorial advantage into points. In a close game, all it takes is one drive and that is exactly what KP put together on Friday. 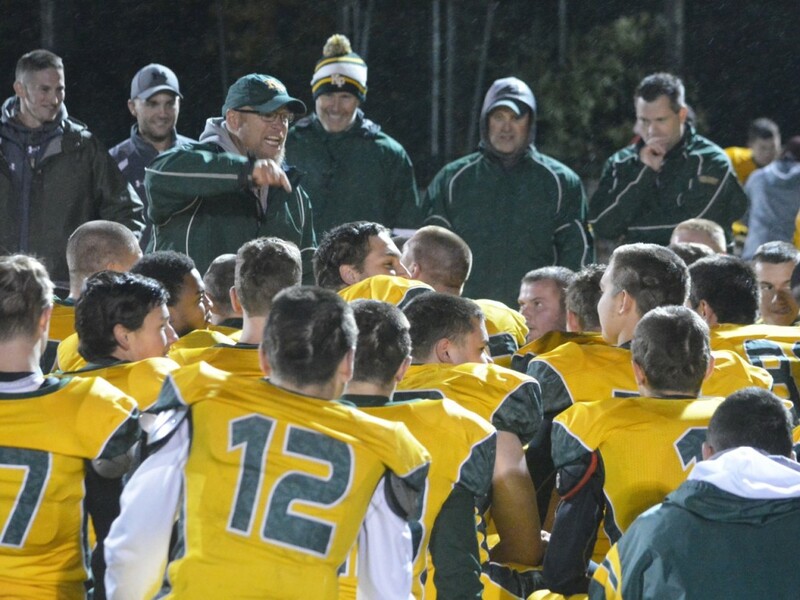 King Philip (1-3, 1-1) will travel to Franklin next Friday, while Mansfield (2-2, 1-1) will host Taunton.